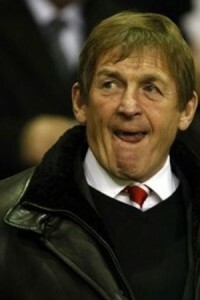 The trouble with installing King Kenny is that he may become too powerful if he gets us back in the top 6. The board won’t want that. I for one love Kenny and want him in now but he needs a good back room and don’t think there is one in place now. Sammy Lee is pretty useless. Things have moved on since Kenny’s time and he needs some coaches who are up to date with training methods. None of this will happen if Kenny is made caretaker as the new man coming in will want his own blood. So it goes full circle. For Kenny to succeed he needs a new backroom. He’s not gonna get them so we won’t see the full effect of having Kenny back. From the beginning if Kenny is appointed, and Kenny has to make it clear himself, this is only till the summer otherwise its gonna get nasty. If we win the 2 games i hand that we have then we can move up the table to 6th place and yet this is what we get from our current manager… “I am extra satisfied we got the winning goal but even at 1-1 I wouldn’t have been in any way dejected because I think today we put Wednesday’s game well and truly behind us”. I deeply want a manager that is disturbed to think of ties or loses! We want wins mate and only wins and think of nothing else and then you might begin to look and sound like a Liverpool manager! Why wonder what Hodgson could do with Liverpool this year? Just look at last season. Hodgson failed in the league and succeeded in the Europa Cup. And that’s exactly what he’s doing this season with Liverpool. That what he is capable of doing. No more no less. Jim Boardman’s article in The Daily Telegraph was spot on. He used the very words that I’ve been saying for months. Roy Hodgson just “doesn’t get it”. To this day, still irks me that the board decided to dismiss RB, appoint a new manager, give a reasonably long contract to a questionable candidate, particularly with H and G’s ownership days numbered. On how many limbs could they have managed to get this wrong? We are paying for an ill informed choice championed by the inexperienced Purslow and it seems to me that Roy just doesn’t want to adapt his methods. We also seem to start the games with lacklustre and only seem to react when we go behind. We should be all over the opposition right from the starting whistle and force them into making mistakes. Work hard and you will earn the deafening “Anfiled Roar”! Roy doesnt seem to undestand the fans and the backtracking after each Royism is painful to watch. We want you to show some spine, spirit and fight and set the team up to WIN. Our stats on gola attempts is 8/9th in the league and that needs to improve quickly. We desperately needed all three points yesterday as even qualifying for Europe, let alone the top 4, was starting to run away from us. Hopefully this will kick start Joe Cole’s impact on the team as I had high hopes for him when he arrrived in the summer. Great to see Fernando wake up to the cause and he needs to take a page out of Pepe’s book and show some fighting spirit for the Reds. Roy’s methods seem outdated and one dimensional and what frustrates me most of all is the cautious and slow approach to games. FFS we could have the more points with 10 wins out of the 20 matches played rather than “being satisfied with the performances and a draw”. It will be fascintaing to see what NESV are really made of in this transfer market as there are some pacey, young attack minded players available in January. If we spend £4-£5Million on potential stars for the future we might as well get Randy Lerner. We are Liverpool not Everton/Sunderland. We need some real quality and that will mean spending in the £15-20 million bracket. Remember Henry & Tom, the fans and players needs some inspiration and the squad has had chronic lack of investment in the past 3 windows so can we really afford to shop at LIDL when our rivals shop at Harrods? This is your first opportunity to really strengthen the first team rather than even more fringe players with potential that hardly make an impact and add to the wage bill. just lets hope its done now at the very least kenny would instill a belief in the players and give the the chance to express themselves also if it was announced that it was only till a suitible candidate was found and that no matter that would be it and not left open to silly interpretation then everyone would understand and have no complaints. so come on fsg act now theres no point in dragging it on please put us all out of our misery. How about this. Maybe that was G and H’s plan. Maybe they installed RH as kind of a final farewell flip of the finger to Liverpool FC. They knew they were getting kicked out so, like two little kids, they spoiled the pot, so to speak. Couldn’t agree more mate. And that G+H agent, Purslow is still some sort of ‘special adviser’ to the new owners!!! If we don’t beat Blackburn Wednesday night LFC need to hire a special forces team to extracate Kenny from his cruise ship and get him back here pronto thus allowing FSG to make him an offer he can’t refuse! I don’t see the point in offering the job to this German chap on a temporary basis when Kenny has been watching the team play for yonks – far more than either Roy or the German. He’s tailor-made for the job because although he hasn’t managed for 20 years he’s watched the team on a regular basis and will be well aware of what is needed to bring the best out of the current squad. He knows his reputation could be tarnished if he messes up and it’s to his credit he’s prepared to take that chance, putting the club above his own reputation. He should be given that chance by the middle of the month at the latest. I have become so frustrated by the owners inaction that whenever I log onto a LFC website the only thing I am looking for is (1) Has Hodgson been replaced, as no progress will be made as long as he is there. (2) Has LFC actually bought a player yet who will, for sure, inprove the team, the last 4 have not done a thing for the team. I have been an LFC for 65 years and I just long to see some progress, present status is no better than under the previous owners.